In comparing playing styles and careers, Carlos Beltran and Chris Duncan had little in common. Yet both prospered for the Cardinals as power producers from the No. 2 spot in the batting order. In 2013, Beltran, a switch-hitter in his 16th season, established a Cardinals record for most home runs in a year from the second spot in the order, according to the Elias Sports Bureau. Beltran had 19 home runs while batting second in 83 games in 2013. Beltran topped the 18 hit by Duncan from the No. 2 spot in 57 games for the 2006 Cardinals. Duncan, a left-handed batter, was a rookie who spent most of the first three months in the minor leagues before sticking with St. Louis in July 2006. Beltran had 24 home runs overall for the 2013 Cardinals. He hit 19 from the No. 2 spot, three from the No. 3 position and two from the cleanup spot in the batting order. When batting No. 2, Beltran often benefitted from the high on-base percentage (.392) of leadoff batter Matt Carpenter. With Carpenter on base frequently, opponents often had to pitch to, rather than around, Beltran. In 2006, Duncan benefitted from batting directly in front of Albert Pujols. Because Pujols was having a sensational season (49 home runs, 137 RBI), opponents would prefer taking their chances pitching to Duncan rather than Pujols. “Duncan has aggressively jumped on the strikes he’s seeing when used as the No. 2 hitter in (manager Tony) La Russa’s lineup, batting before Pujols,” Bernie Miklasz, columnist for the St. Louis Post-Dispatch, wrote in July 2006. Duncan batted .290 (62-for-214) from the No. 2 spot in 2006. Almost 30 percent of his hits from that spot were home runs. He had an on-base percentage of .368 (20 points higher than his career average) while batting second that year. Duncan credited Cardinals hitting coach Hal McRae for instructing him on “hitting out, not hitting up” and encouraging line drives rather than high drives. Duncan hit .361 from the No. 2 spot in August 2006. He was integral in the Cardinals’ successful push toward the National League Central title. 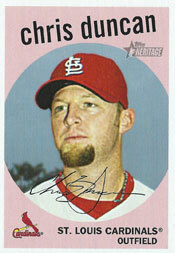 Duncan finished the 2006 season with 22 home runs overall _ second-most for a rookie in Cardinals history. (Pujols hit 37 in 2001, his rookie year.) In addition to the 18 from the No. 2 spot, Duncan hit two from the seventh position and one each from the third and ninth spots. The next year, Duncan hit 21 homers, nine from the No. 2 position. He spent five years in the majors before his career was cut short by injuries.